One of the most commonly asked question on Matriux forums and IRC is how to enable and work with WiFi on a Matriux instance running inside VMWare or any other virtualization software. This tutorial will take you step by step on how to do that. 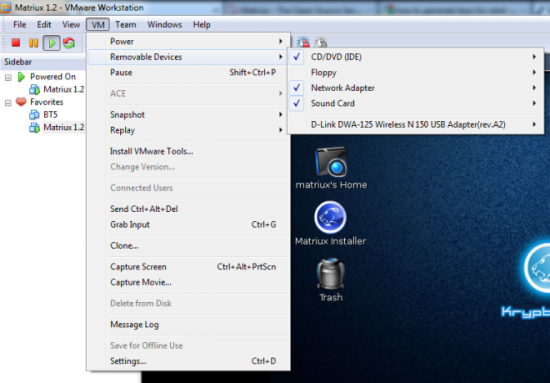 For this tutorial, I am running VMware® Workstation on a Windows 7 Enterprise N Edition which is my Host machine. The Matriux is (obviously) my guest operating system running “Krypton” v1.2. I am using a D-Link DWA-125 Wireless N 150 USB Adapter for this tutorial. Note: Do not connect the Wireless Adapter now. Start Windows 7 (or your Host OS). Start VM Ware and boot Matriux. After you login and obtain an IP, if you execute ifconfig -a, by default you will see only two interfaces i.e., eth0 and lo. Now Connect your USB WiFi Adapter to your PC / Laptop. If you get a Driver Software Installation error or information window (as shown below), click on the Close button to proceed. Now the USB Wifi device is available for VM. You can verify this by switching to VM and clicking on the menu VM -> Removable Devices. The following Message Window should appear. Click OK to proceed. The rest I leave it to your WiFi zeal. Now you can do all your WiFi experiments with Matriux from within your Virtual environment. Join us for more discussion on Matriux and WiFi topics at http://forum.matriux.com or http://is-ra.org/forum/. Also if you are interested in supporting Matriux project as a Developer/Contributor or any other forms such as feedback you are welcome to write to us!